Visit the Narrative Hospital, the Glistenberry Festival and the killing under-fields of Middle Europe, in the company of Blasphemy Fitzworth the Victorian cats-meat man. Nothing however can describe the experience of this novella and its various characters or scenes. Furthermore, it gradually teaches a new language of the mind called Weirdtongue. DF Lewis was born in 1948 only a few miles from where he lives now on the Tendring Peninsula coast, has been married for 40 years & has a son and daughter. He attained a BA degree from Lancaster University (1966-69) and has been an office worker for most of his life. He loves reading fiction, writing fiction creatively beyond his own experience, constructively provoking people and listening to 'classical' music. He has had approximately one thousand five hundred short fictions published in print from 1986 to 2000, some in hard-to-find outlets plus others in literary journals (eg: Stand, Iron, Orbis, Panurge etc.) and professional book anthologies. The latter include three volumes of Best New Horror edited by Stephen Jones and five consecutive volumes of Year's Best Horror Stories edited by Karl Edward Wagner. Other titles include Shadows Over Innsmouth (Fedogan & Bremer), Horror Of The Next Millenium (Darkside Press), Signals: London Magazine (Constable), Cthulhu's Heirs (Chaosium), Touch Wood (Little, Brown), The Ex Files (Quartet), The Ultimate Zombie (Dell), Horror: Another 100 Best Books (Carroll & Graf). He received the British Fantasy Society Karl Edward Wagner Award in 1998. Sixty two years old in 2010, his literary aspirations have threaded his family life and professional business career: fiction experiments in depersonalisation and seeking a unified morality from among the Synchronised Shards of Random Truth & Fiction: 'difficult' extrapolative empathy in the art of fiction writing: and creating/distributing the acclaimed, ground-breaking series of multi-authored anthologies entitled Nemonymous (2001 - 2010). Recently, he has embarked upon a series of internet 'real-time reviews' of other writers' fiction. 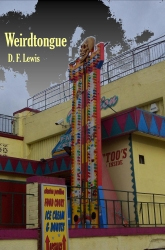 A previous book collection of DF Lewis short fiction was published as Weirdmonger - The Nemonicon (Prime Books 2003). Another DF Lewis book collection is shortly due from Ex Occidente Press entitled The Last Balcony. Text and image on this page copied with permission of InkerMen Press.